Great illustration is not just about the presence of colors or hues. Most of the amazing colored illustrations out there are a product of random sketching or doodling. Some evolved from black outlines and applying colors will bring life to these artworks. However, there are a few artists who start their drawings in a sketch, ink them, give more attention to details and move away the need of colors. One such artist is Nicolas Delort. Currently living in the grey suburbs of Paris, Nicolas Delort creates amazingly detailed drawings mostly with the aim of telling stories, big or small, using ink on scratch boards. 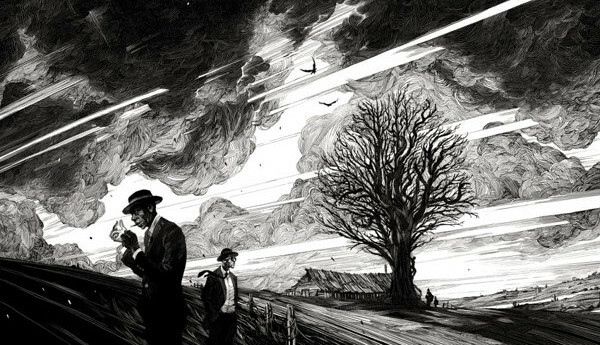 His black and white compositions are well applauded for it’s strong, evocative and intricate details making his art so unique in terms of style and creativity. You The Designer got the chance to talk to Nicolas to ask about some background notes about him and his amazing works of art. Check out the short interview below together with his most notable ink pieces. NICOLAS: I could say I really started drawing around the end of high-school. I would mostly copy Chris Metzen’s art from Blizzard manuals or Dragon Ball art. It wasn’t really a serious thing though. I had no idea it could be an actual job, so I really didn’t apply myself. After graduating from high-school, I went to college to study Physics and turns out I was not fit for the world of academia, at all. I dropped out after a semester. I had absolutely no idea what to do with my life but at that point I signed up in a drawing class, I liked it. I built myself a portfolio, got accepted into the art school I wanted and I’ve never looked back since. YTD: Who or what inspired you to pursue a career in illustration? NICOLAS: Originally, I wanted to do animation. My first year in art school made me understand animation, not unlike in university that just wasn’t for me. I have an undying admiration for animators because I could never find the patience to do what they do. Somewhat ironically, I would move on to a career where I can spend two weeks on the same illustration without getting bored. In my second year, a classmate introduced me to Fables and I was blown away by James Jean’s covers. I started to follow James Jean’s blog, where he was used to be pretty verbose about his career, and I thought “okay, I’d be happy doing that”. YTD: The details of your ink drawings are magnificent! What are your tools in creating such detailed works? NICOLAS: I work on non-inked scratch board. I use three tools: a 0.05 pigment marker, a sable brush and a scratch board nib. I’ll hatch/crosshatch the lighter areas with the marker and I’ll fill in with Indian ink the darker areas and scratch away. I don’t really plan the whole process though, I make it up as I go. NICOLAS: I start by asking myself “What story do I want to tell?” From there I picture the scene in motion in my head as if I were a, uh, floating eye, for lack of a better simile. I turn around the scene, up and down, let the scene unfold, and when I find an interesting angle, I “pause” the action and write down a short description of the scene. Then the rest is a pretty run-of-the-mill type process. I make thumbnail-sized abstract compositions that don’t look like anything to anyone but me. Once I have one that I like, I’ll open Photoshop, blow it up, move stuff around and think with it until I’m happy with the composition. That’s when I start working on a tight line-art. I then do a quick grayscale mock-up so I know where I’m headed when I start inking. I print out the line-art, transfer it onto the scratch board and then the fun part starts. YTD: Have you ever tried making colored works or illustrations in other forms like digital art? NICOLAS: I often do movie screen-caps digital studies to warm up or relax, or when I don’t feel particularly inspired. Once in a while, I’ll make a full color illustration, but it’s really not what I like best. I could never find my “voice” with color and even less-so with digital and felt like it just came off as stiff and bland. There are so many people doing amazing and diverse things with digital now, I feel like I don’t have anything special to add when it comes to color. YTD: Among your ink drawings, which is your most favorite? NICOLAS: The one with the cemetery is the one that fits the most to my personal tastes. From a purely technical point of view, I think it is more subtle and nuanced than my previous works and the composition is engaging. From a storytelling point of view, judging from the reaction of the people who saw it, I think I was able to tell the story I wanted to tell in an earnest way. Some people thought it was a Batman fan-art. I thought that was great, even though it was not my intention at all. That’s what I like most about illustration and art in general, it speaks differently to everyone. YTD: Any advice to aspiring illustrators out there? •Put your art out there. There are literally dozens of platforms on which to share your art now. Confront it to the critical eye of other people. Learn the difference between destructive criticism and constructive criticism. At first it can be hard to tell the difference between the two, but once you learn to ignore the former and embrace the latter, you will improve greatly. •Make the art you’d want to buy, not the art you think would sell. Seems like a trite thing to say, but I wasted a lot of time trying to make art that I thought would be ‘marketable’ when I could’ve spent that time working on more earnest pieces. Those are the pieces that people noticed in the end. •Never stop learning, never stop having fun. Try to make every piece an exercise on something. Sometimes commercial work can be a little soul crushing as well, so don’t forget to turn off your brain every so often and draw stuff that makes you happy. You can check out more amazing works of Nicolas Delort on his blog and over his Behance portfolio. Tell us your thoughts about those amazing ink drawings or suggest a creative you want us to feature or interview next by commenting below. Stay awesome everyone!